Dark, bright eyes. Such a contrast to that shock of short, white hair. A lean frame burning with an intense energy. Gauri Lankesh was vital, she was alive. Last night, she was shot dead at her house in Bengaluru. She spoke her mind. She said what she felt. She wrote what she believed. 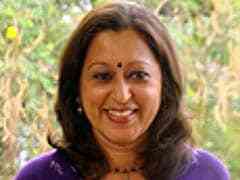 Gauri, 55, was a sharp and brave woman. Her views were considered leftist and anti-Hindutva. Not the most popular stance in the country right now. In 2013, I asked Gauri to join a meeting over dinner with Prannoy and Radhika Roy as they toured Karnataka ahead of the last election to get a feeling of the different ground realities. Her views on state politics came from the left - and were clear and strong. As was the way she questioned me later about why I had invited some of the other guests! She was an articulate, strong voice for issues like communal tension, Naxals, the murder of rationalist and writer M M Kalburgi at his home in north Karnataka just over two years ago. In the last few months, I often asked her to join in such discussions on our channel. If it clashed with her Thursday deadline for the weekly Kannada paper she published - well, nothing would divert her from that. The last time we met, after a hug, she gave me a message for my husband. He had been shooting for a film directed by her sister Kavitha in Chikmagalur. And much of his time on set had been spent with Kavitha's feisty dog, Bhima. Also a dog lover, she said, "Tell Nandu that his and Kavitha's dog is being thoroughly pampered." That is the last time I saw her. An older memory, a time when we were alone, was at my parents' house. The day my father died. Her father was P Lankesh, a noted Kannada writer and an outspoken journalist himself. His "Lankesh Patrike" was a huge success. A tabloid run without ads, running only on subscriptions. Lankesh and my father, Ramachandra Sharma, also a Kannada writer, were close friends - they fought, they made up, they played cards at his newspaper office in Gandhi Bazaar in Basavanagudi in Bengaluru. Lankesh, though younger than my father, died earlier. By the time Gauri reached my home, my father's body had been taken to the crematorium. She sat with me a while and we imagined our fathers meeting wherever they had landed up - and bringing out the cards and whiskey... it made us smile in the middle of our sorrow. Gauri, can you see them both now?